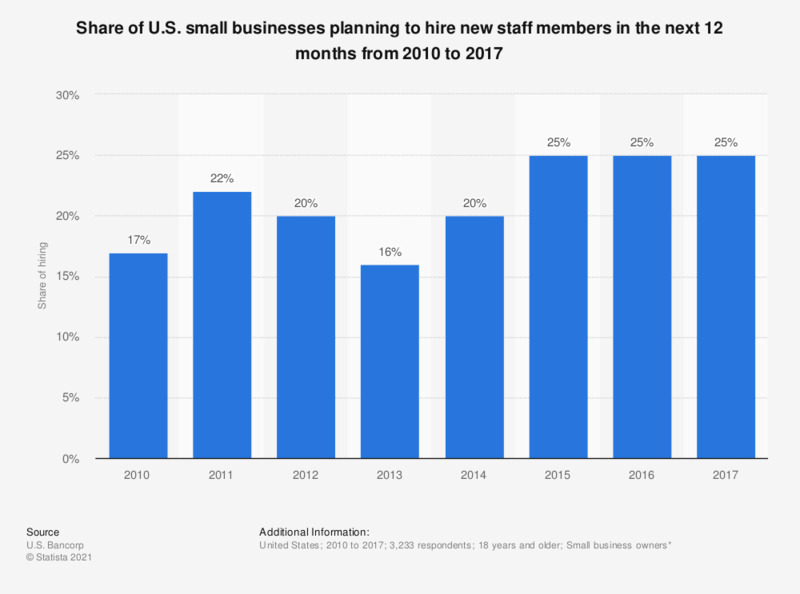 This statistic shows U.S. small business owners' responses to a survey question asked from 2010 to 2017, about plans for hiring new staff members. In 2013, around 16 percent of respondents reported that they were planning to take on new staff members in the next 12 months. By 2017, this figure had increased to 25 percent. This survey was conducted in the following states: Arizona, Arkansas, California, Colorado, Idaho, Illinois, Indiana, Iowa, Kansas, Kentucky, Minnesota, Missouri, Montana, Nebraska, Nevada, New Mexico, North Dakota, Ohio, Oregon, South Dakota, Tennessee, Utah, Washington, Wisconsin, and Wyoming. The surveyed small business owners had less than 10 million U.S. dollars in annual revenues. Data prior to 2017 can be found in the 2016 report. Statistics on "Professional staffing in the U.S."
Which segments stand to increase jobs as a result of automation, and which will see reductions?